How to recover Adobe Acrobat PDF passwords? PDF Password Cracker can recover PDF password so that you will be able to open, copy, print or modify the Adobe Acrobat PDF documents. When you forget the PDF owner password and want to edit the content of some PDF documents, it will be a good assistant for you. PDF Password Cracker is a professional PDF password recovery app that can retrieve the PDF password. It supports 40-bit RC4 decryption, 128-bit RC4 decryption and AES decryption. Secondly, please add the password protected PDF documents. You can drag and drop the PDF files to the process file list of the software. You can also click Open PDF (s) button on the interface of the software, browse and choose the encrypted PDF files. Then, click the Open button in the pop-up “PDF Password Cracker” dialog box to add the PDF documents. When the “Save As” dialog box pops up, please choose an output location, input file name respectively in the File name spin box and click Save button. NOTE: You cannot use the original name of the PDF file, you have to change it. PDF Password Cracker will instantly remove PDF password and the success information will be shown in the file list of the program. The screen will display with the status of the password removal with “Succeed”. To view the decrypted PDF document, please right-click on the entry and click “View Target Document” in the pop-up list. If you want to recover password for PDF documents that are protected by owner passwords, you can try PDF Password Cracker. How to retrieve password of a MS Access Database document? Wanna retrieve password of a MS Access Database document? Access Password Recovery can recover password for Access Database document. 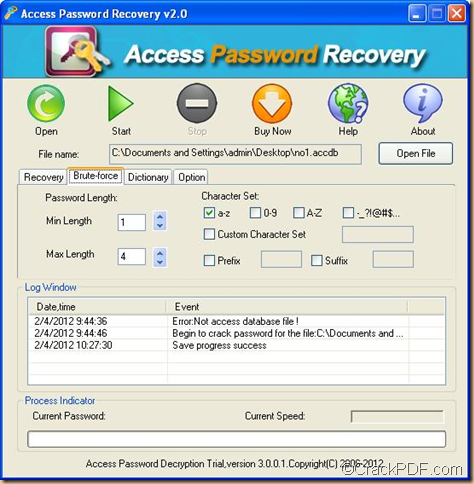 Access Password Recovery has the ability to restore password for Access documents. It is able to instantly find the forgotten password of a MS Access (2003 and earlier) document. It supports three different methods:Brute-force with Mask Attack (Trying all Possible Combinations), Brute-force with Mask Attack and Dictionary Attack (Recommended). 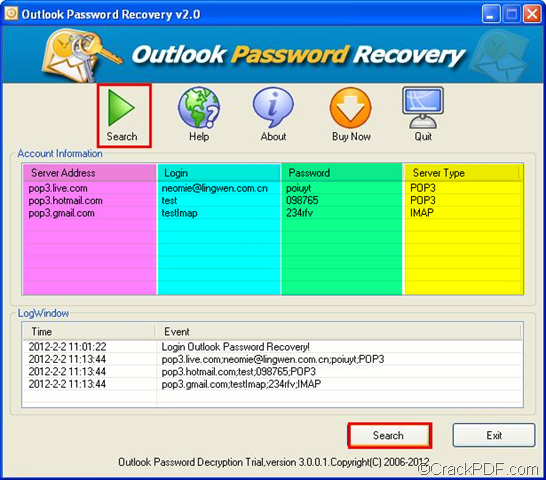 The following contents will show you how to recover Access password with this tool and you just need to follow step by step. Step 1 : Please download and install this app into your PC. First of all, you need to download Access Password Recovery and follow the setup wizard to install it into your PC. Step 2 : Please launch the app and import the Access document. In fact, the software will automatically run after you have installed it. You can also launch it by double clicking its icon on the desktop. To import the Access document, you can click the Open button on the top of the main interface or click the Open File button below “About” button on the main interface. Step 3: Please choose a suitable recovery mode according to your actual situation. In the “Recovery” tab in the middle of the interface, you can see three modes to decrypt the encrypted Access document. Brute-force Attack with Mask Attack (Trying All Combinations) can help you recover Access document password when you remember nothing about the password. Brute-force Attack with Mask Attack is useful when you remember something about the password.Dictionary Attack (Recommended) will try the most likely password combinations of words and phrases in the built-in dictionary. Step 4: Please click the Start button on the interface to start the recovery. It is very simple to use Access Password Recovery to retrieve password of a Access database document,right? For any concerns, welcome to leave your comments here. How to remove password from Microsoft Access Database? Access Password Recovery can remove password from Microsoft Access Database. It can instantly break password for Microsoft Access 2003 and earlier versions. 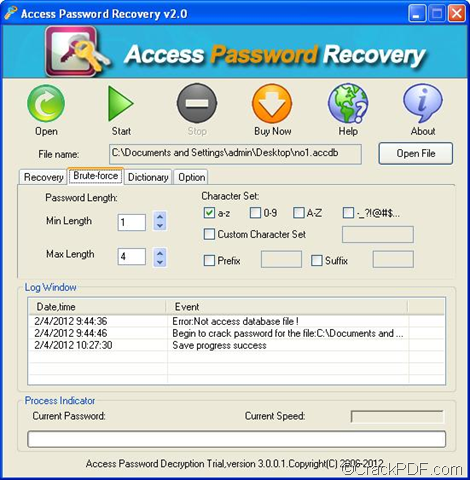 Access Password Recovery is a practical application that can recover password for Access database document. It can help you retrieve the password via three different methods:Dictionary Attack (Recommended), Brute-force with Mask Attack and Brute-force with Mask Attack (Trying all Possible Combinations). The above three modes are suitable for different situations. If you remember a little information such as the password length, the character set of the password, etc., you need to try the Brute-force with Mask Attack mode. In the following contents, you will see how to use this mode in Access Password Recovery to find the Access database password. Please download the installer of Access Password Recovery, then double click the installer and follow the setup wizard to install the application on your computer. Launch the application on your computer, then click the Open File button below “About” button on the main interface to add the Access database document. You can also click the Open button on the top of the main interface to add the file. You can set maximal and minimal password length, character set, prefix and suffix in the interface. Click the Start button on top of the interface to start the process. 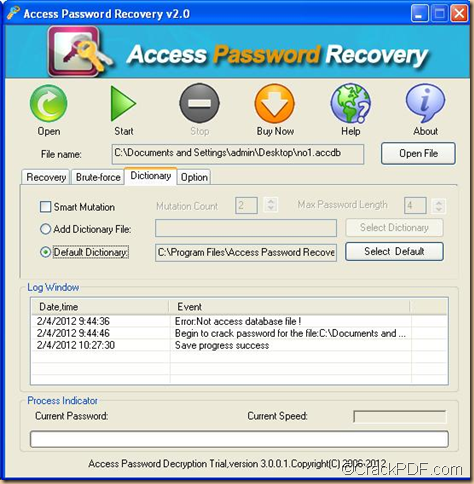 By now, if you read this article till here, I think you have already know how to use Access Password Recovery to recover password from MS Access database documents. 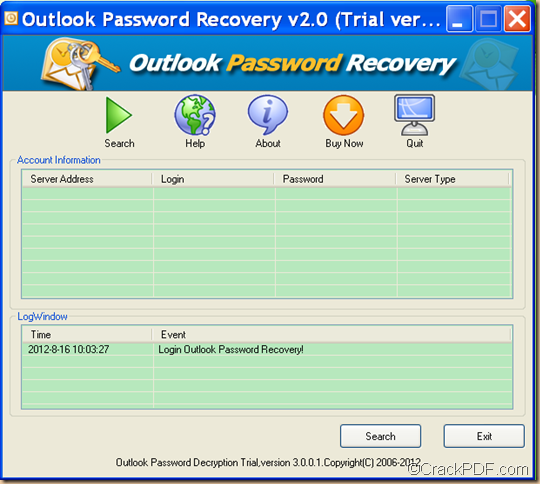 Access Password Recovery can recover Access database password. It can instantly retrieve password for Microsoft Access 2003 and earlier versions. 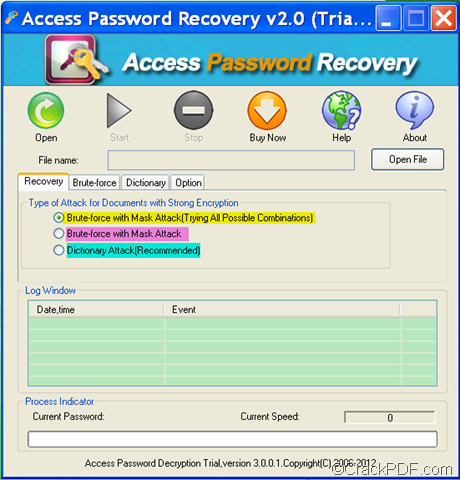 Access Password Recovery is a professional application that can restore password for MS Access database documents.It can help you find the password via three modes: Brute-force with Mask Attack (Trying all Possible Combinations), Brute-force with Mask Attack and Dictionary Attack (Recommended). 1. Please download Access Password Recovery, and then follow the setup wizard to install it on your computer. After installation, you may launch it. Click the Open button on the top of the main interface. You can also click the Open File button below “About” button on the main interface to add the document. Check the radio button of “Dictionary Attack” in the “Recovery” tab. You can check the radio box of “Mutation Count” on this interface to set the mutation count and max password length. You can also check the radio box of “Add Dictionary File”, and then click the “Select Dictionary” button on the interface to add a new dictionary. 4. Click the “Option” tab in the middle of the main interface, and you will see the corresponding setting interface.You can make the application automatically save the recovery state by setting the time in the interface. You can also check the radio box “Shut down the computer after cracking finishes” option if you need in the interface. 5. Click the Start button on the top of the interface to start the recovery. 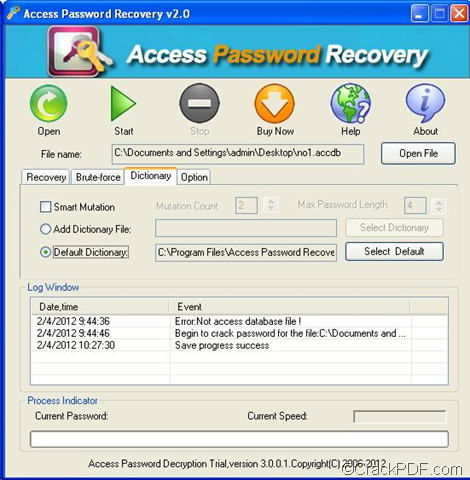 With Access Password Recovery, you can quickly recover password for MS Access database documents. 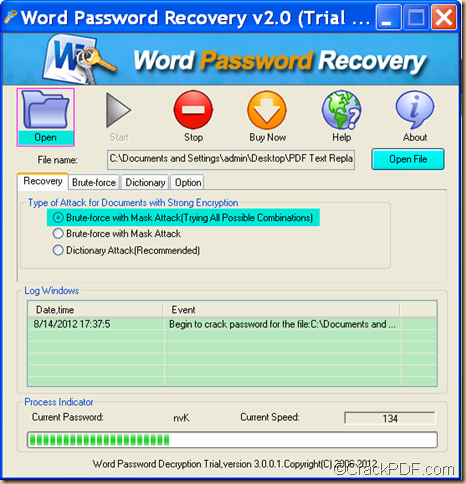 How to accurately recover Word password? Have you ever forgotten Word password, and you are in urgent need of the Word document? In our daily work and life, we would like to encrypt extremely important confidential Word document with passwords and then somehow forget or lose, which cause many hurdles. Luckily, this problem can be easily solved with CrackPDF Word Password Recovery. 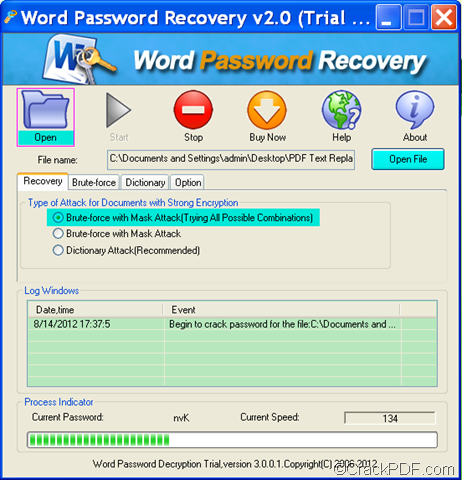 CrackPDF Word Password Recovery is a professional and easy-to-use application that can easily recover forgotten or lost Word password. It is able to securely seek back lost or forgotten password for all types of Microsoft Word 2010/2007/2003/2000/1997 files with three password recovery methods-Brute-force with Mask Attack (Trying All Possible Combinations), Brute-force with Mask Attack, and Dictionary Attack. If you still remember how long the password is or have any idea about the character set of the password, or you know it is made up numbers, letters or symbols, you can try the brute-force with mask attack. 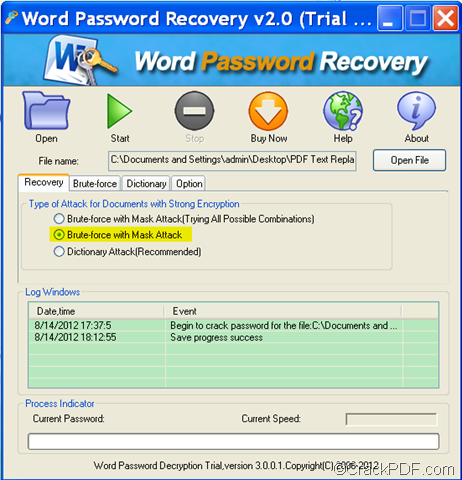 The following will tell you how to recover Word password with CrackPDF Word Password Recovery. 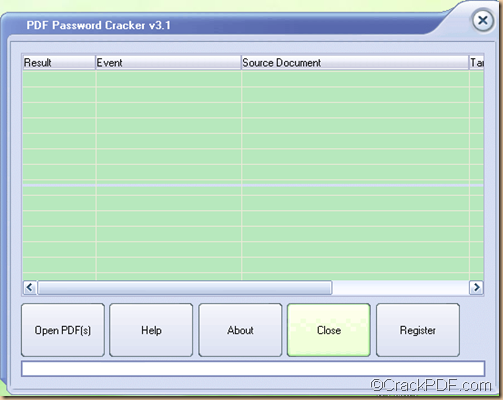 Firstly, download CrackPDF Word Password Recovery, then install and launch it. Secondly, add the encrypted Word files. Thirdly, set options — click the radio button next to Brute-force with Mask Attack. Then, click Brute-force, and then you will see a setting interface as illustrated below. Then you can set the corresponding options to narrow the combination possibilities. For example, you remember that the password is a pure letter password with no longer than four letters.You can specify 1 in the Min length combo box, specify 4 in the Max Length edit box, and click the check box before a-z under Character Set. Lastly, click Start to start the recovery. 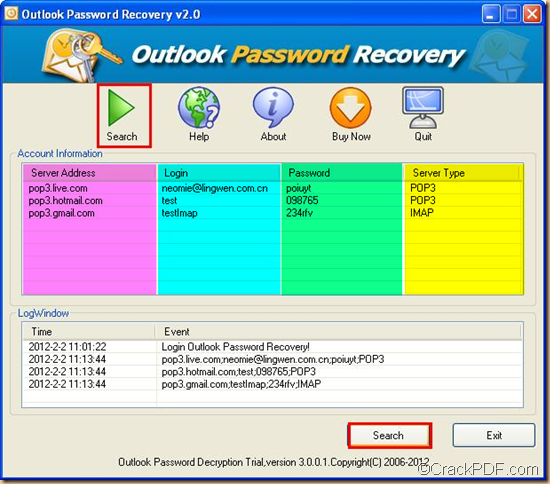 That is how to retrieve password from Word document with CrackPDF Word Password Recovery. 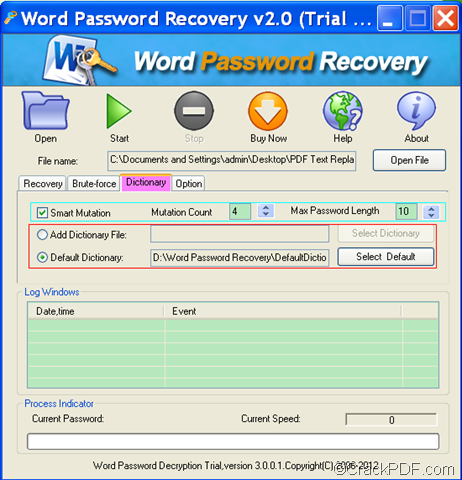 You can try it to see if it can accurately recover Word password. 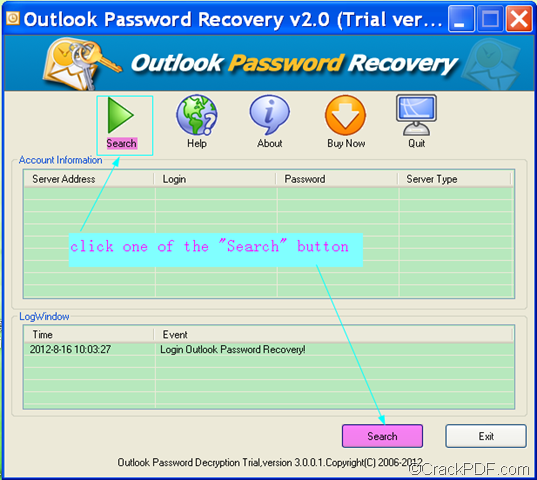 How to recover forgotten and lost MS Word password? This article is mainly about how to recover Word password that is forgotten or lost. 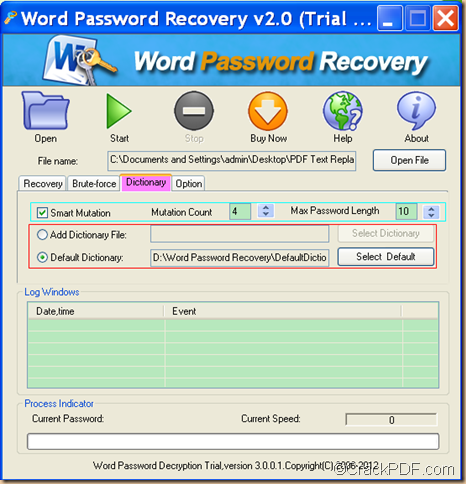 To make it possible, we will make use of a password recovery tool- CrackPDF Word Password Recovery. It is a professional and practical application that can retrieve the forgotten password from Microsoft Word 2010/2007/2003/2000/1997 documents. 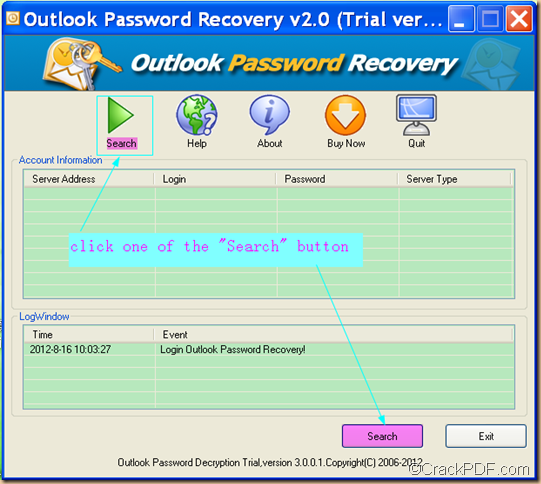 Below are the detailed steps of recovering forgotten or lost Word password. Download CrackPDF Word Password Recovery, then double click the .exe file and follow the setup wizard to install the app on your computer, and then double click the icon on the desktop to launch it. Click Open or Open File button to add the encrypted Word file to the application. Step 3.Choose a password recovery mode. 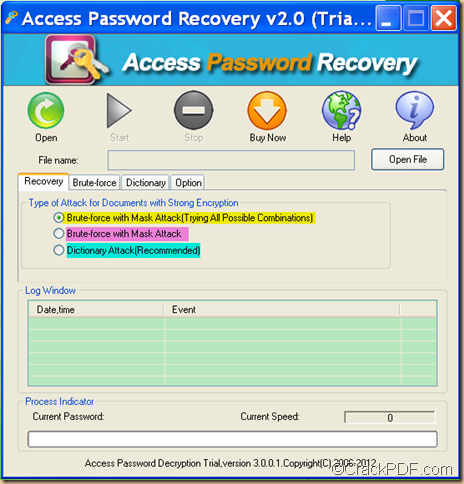 It provides three password recovery modes:Brute-force with Mask Attack (Trying All Combinations), Brute-force with Mask Attack, and Dictionary Attack (Recommended). Brute-force with Mask Attack (Trying All Combinations) is used when you remember nothing about the password. So, if you are blank about the Word password, you can choose this option. Click the Start button to start the recovery process. You can view the process status, current password, and current speed under Process Indicator. The Brute-force with Mask Attack (Trying All Combinations) mode will try all possible Word Password combinations, so it will take longer time compared with Brute-force with Mask Attack, and Dictionary Attack(Recommended). Dictionary Attack (Recommended) will try each single word or word combinations in a built-in or self-added dictionary. Brute-force with Mask Attack is useful when you remember a little bit about the password. 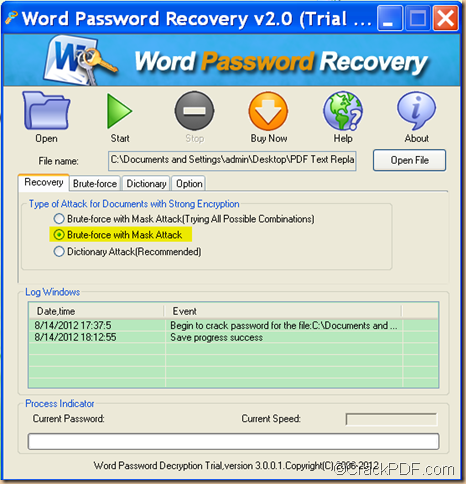 Now, you can try CrackPDF Word Password Recovery to retrieve forgotten password from your Word documents by yourself!